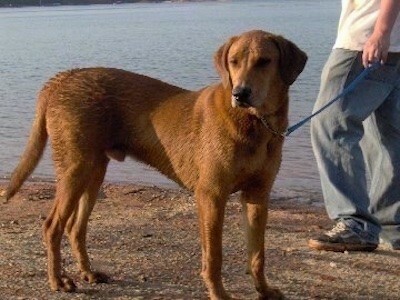 "Tucker the 1-year-old Redbone Coonhound / Alaskan Malamute mix breed dog. He is energetic, playful and loyal. He gets along with horses, dogs, catsand cows. He lives on a 100 acre farm and goes for runs every day and trail rides with the horses. He loves car rides. He has a food allergy to Milkbones. His tail is black on the tip. He is a very loving dog. The kids are always climbing all over him."